Do makerspaces belong in academic libraries? You bet! Read on to hear how one librarian took the initiative to bring technology tools and creation space into the library to serve community members, both young and old. Population Served: SPC students, faculty and staff, as well as the public, including library patrons and elementary, middle-school, high-school and homeschooled students. 1. When was the Innovation Lab developed and what was the impetus for it? Our Grand Opening was in June 2014, so the Innovation Lab (iLab) is three years old at the time of this writing. 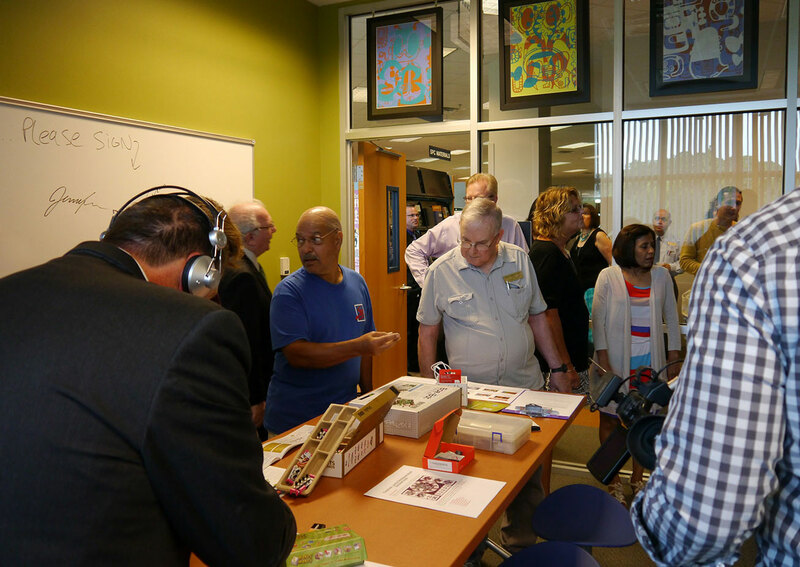 More than 100 people attended the Grand Opening, including college leaders, city government officials and technology enthusiasts from the community, all who were eager to experience what the iLab had to offer. The primary impetus to establish the iLab was selfish on my part. I have always been a technology tinkerer, and I thought that it would be fun to play with emerging technologies as part of my job duties so that I could eventually teach others how to use everything in the iLab. It is my goal to introduce people to the technology and then watch them take it to the next level and do something useful with it. Inside the Innovation Lab, there are no judgments or grades, and we encourage users to “color outside the lines” and make beautiful mistakes. It has been an exciting ride so far. 2. What are your technology initiatives, and how are they funded? 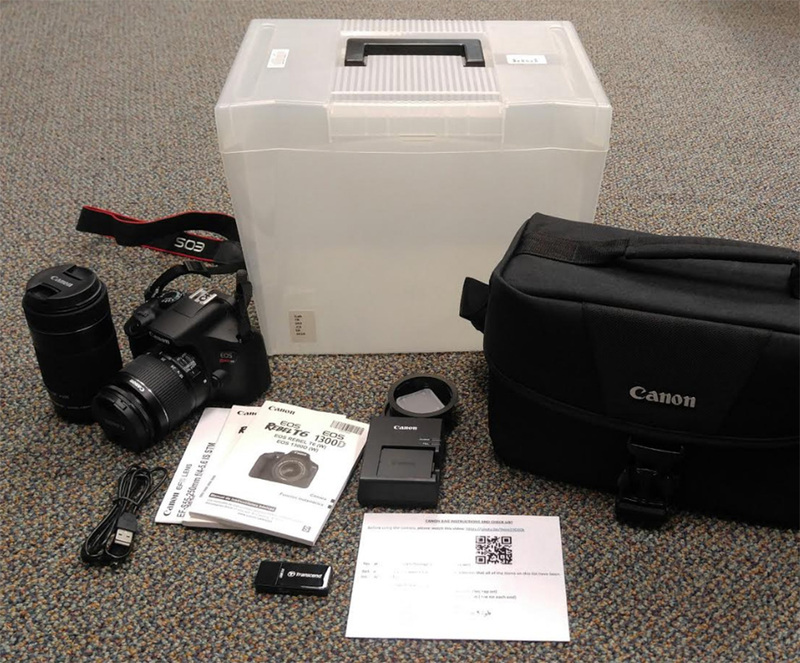 The drive to provide equitable access to technology started when I applied for grants from the St. Petersburg College (SPC) Foundation to purchase tools for our technology playground and let other people start to experiment with them. You can view my grant application here. In 2001, I received a $25,000 grant from the Friends of the Gulfport Public Library to create a mobile laptop lab to teach computer literacy to the elderly. This past January, I worked with some great people and championed the Gadgets for Good electronic recycling initiative in partnership with Tony Selvaggio, founder and CEO of Smart Recycling, and Tara Newsom, Director of SPC’s Center for Civic Learning. The initiative’s goal was to collect and recycle used electronics to develop a mobile technology incubator, which will deliver equitable access to technology and provide learning opportunities to those in need in our community. Close to 2,000 pounds of electronics were donated to various St. Petersburg College campuses and picked up by eSmart Recycling, who will inventory them, destroy all data and prepare the electronics for recycling. In May 2017, SPC received their first installment of 10 laptops as part of the mobile technology lab. You can read more about this initiative here. The Petersburg College Foundation’s Innovation Grants provide financial resources to implement programs that broaden the scope of the curriculum, deepen the college experience and improve student achievement. The program is open to full-time faculty, staff and student groups with faculty advisors, and it awards grants ranging from $500 to $3,500. I am so fortunate to have received seven SPC Innovation Grants since 2011, totaling $21,695, which have helped me advance the mission and goals of SPC. 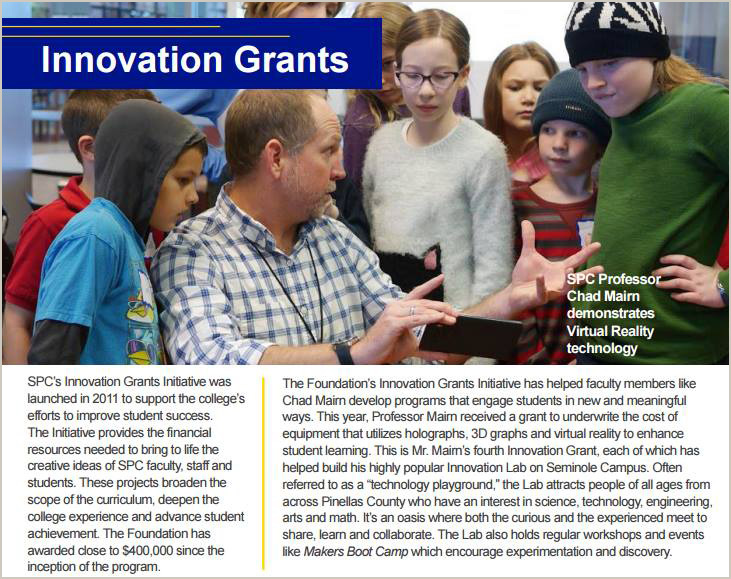 In October 2015, the iLab received a $7,500 Curiosity Creates Grant from the Walt Disney Company, in collaboration with ALA’s Association for Library Service to Children, to expand our successful Maker Boot Camp. This program helps promote exploration and discovery for children ages 6 to 14, as well as teens and adults. Every workshop was and always will be free. Imagination, originality, flexibility, decision-making, communication, self-expression, collaboration and motivation are the critical components of creativity that are integrated into the curriculum at Maker Boot Camp. Through the camp, we have offered video game design, robotics, 3-D design and printing, circuitry and electronics, virtual reality, drones, video and audio editing, Hour of Code and sewing workshops. There are many other education opportunities currently in the works. Community notebooks are provided to all participants so that they can reflect on their learning process and share it with their community of innovators. You can learn more about the iLab and Maker Boot Camp through this short documentary. 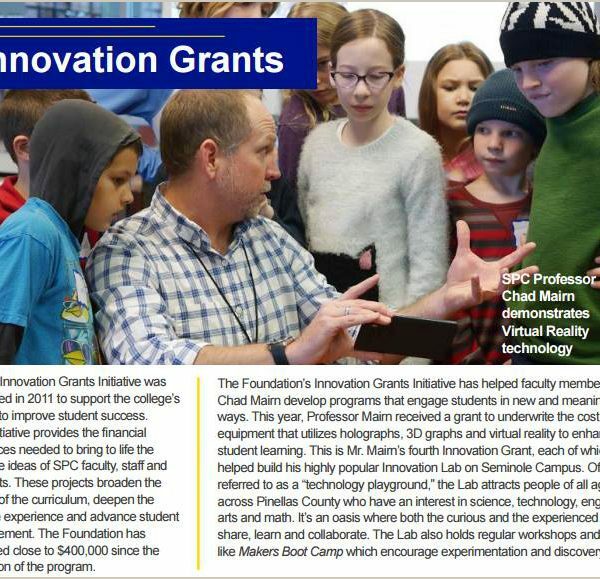 In early 2017, the iLab was awarded three additional St. Petersburg College Foundation Innovation Grants to fund the following initiatives: Microsoft HoloLens: Holographic Enhanced Learning; Graphs and Geometry: Engaging and Illustrating Mathematics with 3D Printing; and Virtual Reality: A Renaissance. The iLab’s initiatives made it inside the pages of the Petersburg College Foundation 2016 Annual Report, just below Steve Wozniak and David Brooks! 3. Can you describe how the iLab functions? The iLab is a collaborative learning environment open to the public. People of all ages with common interests (e.g., science, technology, engineering, digital arts, etc.) can meet, socialize and collaborate while sharing innovative ideas and learning new skills. The iLab offers a variety of resources, including a growing list of emerging technologies, books, magazines and interesting people with a variety of skills and experiences to share. For a list of the lab’s current equipment, resources and tools, visit our What does the Innovation Lab have? web page. 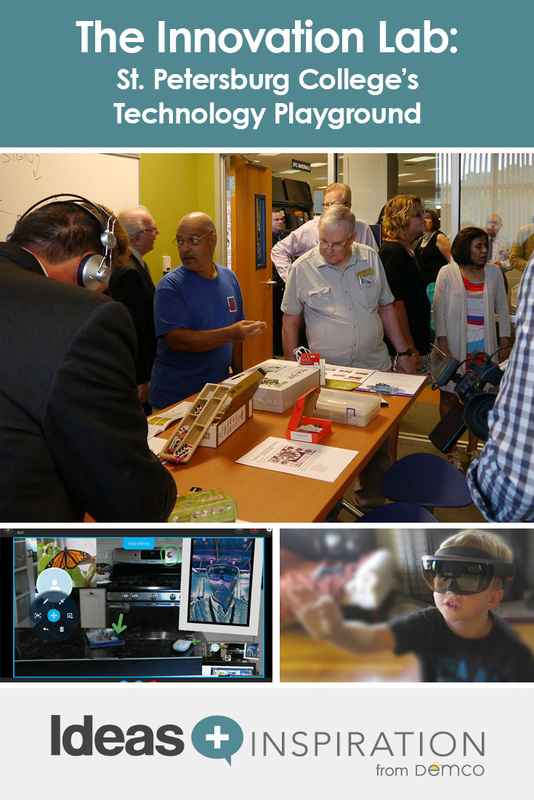 The goal of the iLab is to educate people on emerging technologies and to give them a chance to play in our “technology playground.” People who use the iLab get to see first-hand what can be accomplished when one dreams, thinks and creates innovatively. We have a good group of volunteers who can help people work with the equipment in the iLab and to help make an idea come to fruition. The iLab is open only when we have an SPC-confirmed volunteer, the manager and/or an intern available because the equipment is expensive and requires some training to learn how to use properly. The iLab does not have set hours at this time, but we do see a lot of activity regardless. Usually, people will set up a time to do a certain task, such as 3-D printing, or come into the iLab to finish a job. We schedule this through online forms (see examples here and here). In addition, we use this form to gauge interest for new workshops. All of our workshops, events and meet-ups are free and open to the public, allowing everyone a chance to work with emerging technologies that are playing a role in society today and well into the future. We do a lot of collaboration, such as helping local inventors see their prototypes come to life via the 3-D digitizer and printer, and we offer other supportive services to make their ideas a reality. We have had a few people print prototypes to make sure they are going to work as planned before they submit the designs to be patented or possibly mass-produced. As for the students at SPC, I like to act as a guide to help them grab onto an idea they love and work hard to make it a reality. Ideas are easy; implementing them requires work! I believe that we should be teaching students how to adapt to a career that may not exist yet instead of training them for specifics. Learning how to troubleshoot a piece of technology or to solve a problem is what students learn in the iLab. This is illustrated perfectly by a recent project we have been working on with a Medical Capstone student. 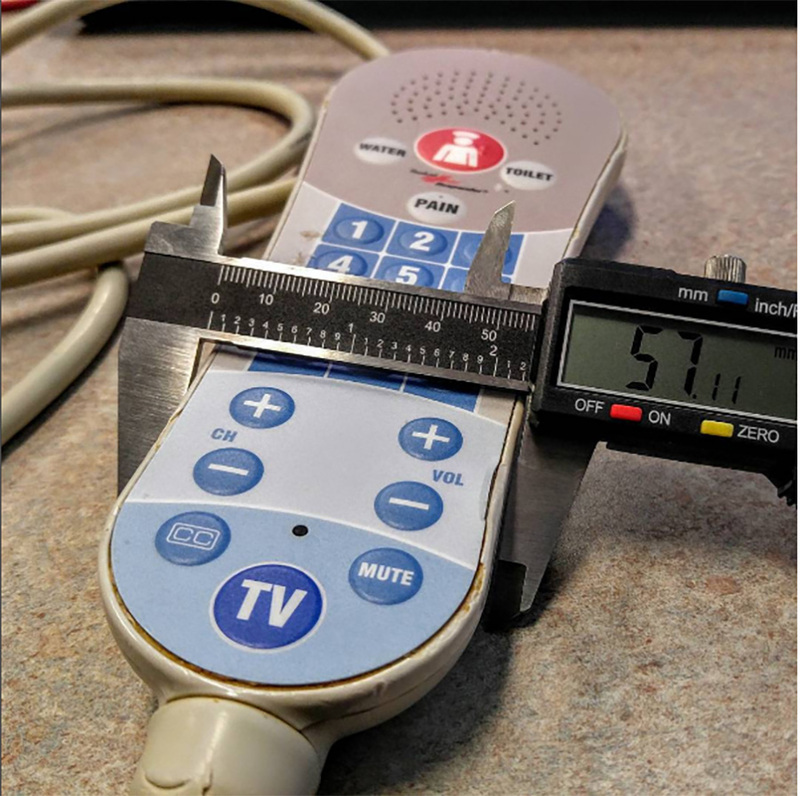 In her hospital, they have a slogan, “Call Don’t Fall,” which is used to remind high-risk fall patients to use the nurse intercom devices at all times to avoid unnecessary falls. Their nurse intercom devices kept falling off patients’ beds, so she wanted to solve this problem with 3-D design/printing. We were able to design a prototype that worked! Here are some pictures and a video of the student’s “3D Printing in Healthcare” display for the Medical Capstone Showcase. The student won an award for this project, and the intercom holder may now be mass-produced! 4. What are some of the most-used tools? The 3-D printer is used the most, but virtual reality (VR) and augmented reality (AR) are becoming more popular. Watching people experience VR/AR for the first time is so fun because they usually do not know what to expect. We now have a HoloLens, an HTC Vive and an Oculus Rift. We are just starting to test and write reviews for VR games at PlugHitz Live. This is a great opportunity for students to gain experience writing for a purpose instead of submitting a paper that may just be thrown away or collect dust in a file cabinet. Research papers are obviously important, but this shows that there are other options for publishing work online. There is a ton of learning potential with VR and AR. 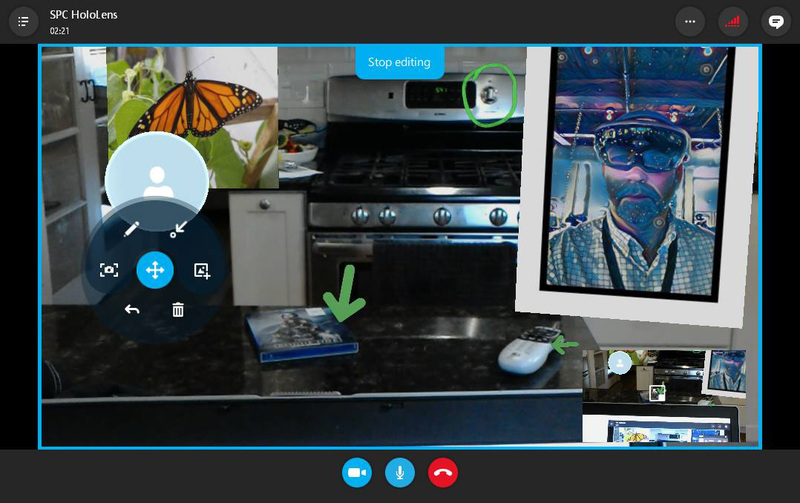 For instance, using Skype within the HoloLens can offer true, virtual, 360-degree tours. While wearing the HoloLens via Skype, I can use a drawing tool to mark-up and point to things that the person not wearing a HoloLens can see on their computer screen. The person not wearing a HoloLens can also draw on and point to things for me to see. 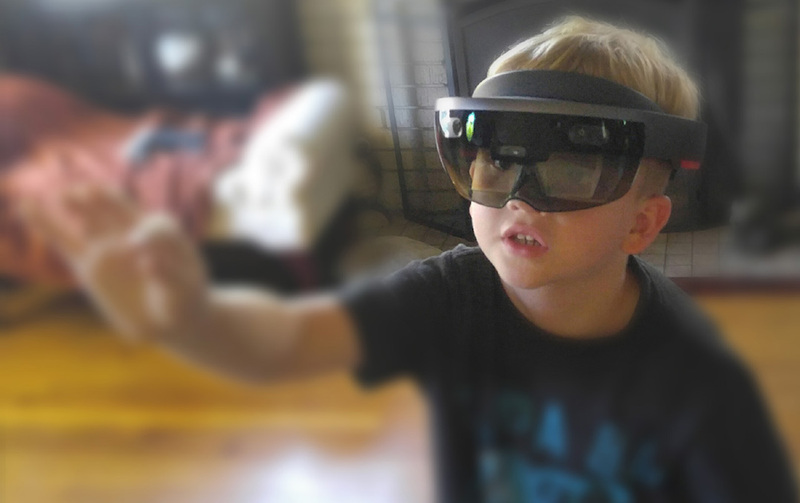 My 10-year-old daughter was able to forward images and documents stored via OneDrive’s cloud storage to my HoloLens, so I could interact with those files as holograms. Videos and pictures can be captured while using the HoloLens too. Just imagine what can be accomplished with this technology; traditional education and more will be changed forever! 5. Can you describe partnerships you have with other departments at the college? The Engineering Club meets regularly in the iLab, and for one of our collaborative projects, we built a drone that includes a GoPro video camera. We have also almost finished building our first 3-D printer where the parts were printed from our FreeFab 3D Monolith. We are replicating printers in the iLab! We are working with various English Composition professors to help their students with multimodal assignments. 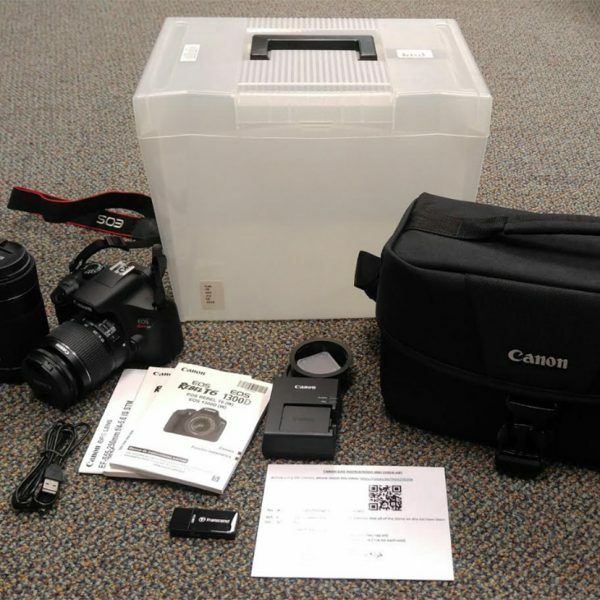 We are collaborating with the Sandbox News, SPC’s student newspaper, to circulate a Canon EOS Rebel digital camera. We are partners with the Digital Den, a digital arts studio house across the street from our library at the Seminole Recreation Center. The Digital Den is the first of its kind in the state and features 10 iMac computers loaded with 33 creative software programs, 10 programming and gaming software applications, Wacom tablets, a green screen and MIDI music keyboards. Mark Ely, the City of Seminole’s Community Development Director, donated all the funds from his own pocket for this program and came to the iLab to make sure we complemented each other, and we do — very well! I have taught classes over there and they have brought people over here to learn as well. SPC even has some interns working over there, so there is a nice cycle of learning going on in this area. An innovative music studio and other emerging digital arts technologies are currently in the works and should be ready for use in fall 2017. We are recruiting SPC Faculty and local computer programmers to work as mentors in our CoderDojo, a free computer-programming club for young people. 6. Why was the library a good fit for a technology and creation space on campus? Libraries are about discovery. They have started moving away from being places of consumption and are becoming places of production. Giving people a safe and comfortable place to dream, think and create is very important because it enriches people’s lives by giving them a chance to explore various technologies and educational opportunities that they might not otherwise have access to. STEAM education refers to hands-on teaching and learning in the fields of science, technology, engineering, art and mathematics. 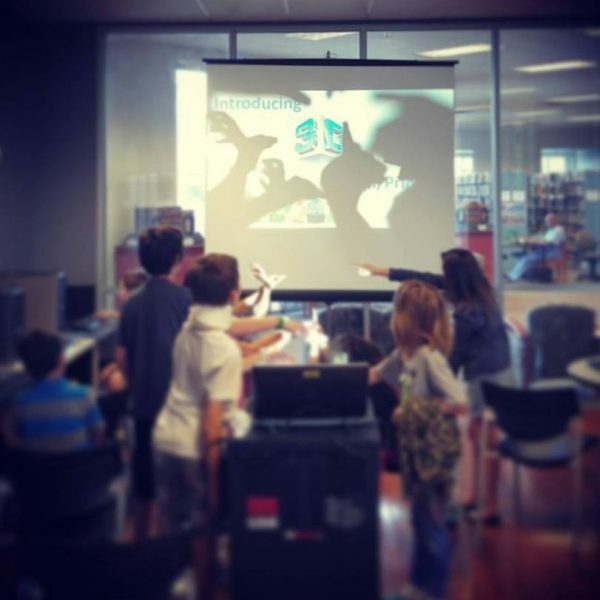 There are several ways to incorporate the STEAM educational framework into your library; having a makerspace, innovation lab, incubator or whatever you call your space is vital, and it will undoubtedly support your library’s mission for lifelong learning. 7. Any tips for other libraries looking to develop this type of space? It sounds cliché, but just do it! More than likely, there is a room or even a small space in your library that is being underutilized that can become a makerspace for people to explore something. It can start with something as simple as a box of Legos, or some materials to paint rocks to hide in the community (perhaps coupled with a program on geocaching). Be creative! Survey your users and find out what kinds of technology and/or crafts they would like to explore, and write a grant to get those things in your library. Ask the Friends of the Library to see if they can help you acquire something for your space. There really is no excuse not to have something fun and creative in your library. You can learn more about our story in this short film and stay connected to the Innovation Lab on our Tumblr and Facebook pages as well as on our Resource Bundle. 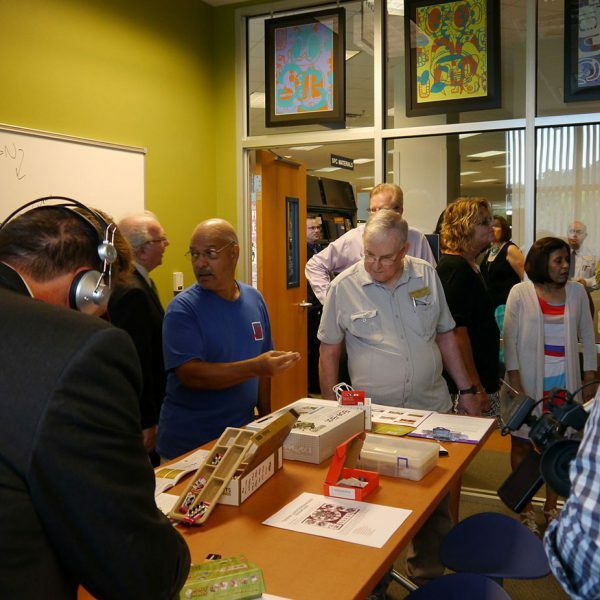 The Sandbox News Facebook page regarding the iLab’s Grand Opening. Photographs courtesy of Chris Demmons. Chad is a librarian, teacher, author and self-described geek who frequently shares his enthusiasm for all things technology as a speaker at library and technology conferences. He is an Information Services Librarian and Assistant Professor at St. Petersburg College and also manages the college’s Innovation Lab. 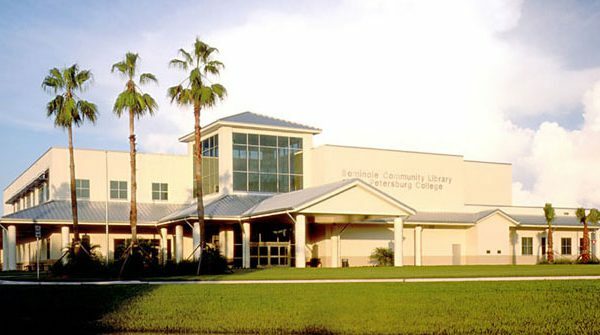 While an undergraduate studying Humanities at the University of South Florida (USF), Chad was awarded a Library of Congress Fellowship archiving Leonard Bernstein’s personal papers. During his Library and Information Science (LIS) graduate work, also at USF, Chad became a technology liaison between the Bill Gates Learning Foundation and Florida public libraries. Much of Chad’s recent interests have focused on mobile and emerging technologies. Chad has written several book chapters and numerous articles on library technologies. In 2016, he was awarded the League of Innovation Excellence Award in Teaching and Learning for Innovation in the Use of Technology. Chad also plays drums in two bands, Fowler's Bluff and Low Season, and he also organizes Pinellas Comic and Maker Con, which is held each year at the St. Petersburg College Seminole Campus.